October is Breast Cancer Awareness Month. Here at Uptown Smile we are passionate not only about your dental health, but also your overall health. Breast cancer is the most common cancer among American women, with the exception of skin cancer. Statistics state that about 1 in 8 (12%) women in the US will develop invasive breast cancer during their lifetime. About 2,240 new cases of invasive breast cancer were expected to be diagnosed in men in 2013. A man’s lifetime risk of breast cancer is about 1 in 1,000. About 39,620 women in the U.S. were expected to die in 2013 from breast cancer, though death rates have been decreasing since 1989 — with larger decreases in women under 50. These decreases are thought to be the result of treatment advances, earlier detection through screening, and increased awareness. Besides skin cancer, breast cancer is the most commonly diagnosed cancer among American women. Just under 30% of cancers in women are breast cancers. White women are slightly more likely to develop breast cancer than African-American women. However, in women under 45, breast cancer is more common in African-American women than white women. Overall, African-American women are more likely to die of breast cancer. Asian, Hispanic, and Native-American women have a lower risk of developing and dying from breast cancer. In 2013, there were more than 2.8 million women with a history of breast cancer in the U.S. This includes women currently being treated and women who have finished treatment. About 5-10% of breast cancers can be linked to gene mutations (abnormal changes) inherited from one’s mother or father. Mutations of the BRCA1 and BRCA2 genes are the most common. Women with a BRCA1 mutation have a 55-65% risk of developing breast cancer before age 70, and often at a younger age that it typically develops. For women with a BRCA2 mutation, this risk is 45%. An increased ovarian cancer risk is also associated with these genetic mutations. In men, BRCA2 mutations are associated with a lifetime breast cancer risk of about 6%; BRCA1 mutations are a less frequent cause of breast cancer in men. 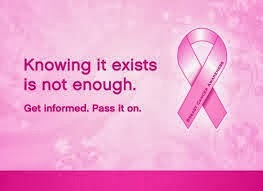 Breast cancer is the second leading cause of cancer death in women, exceeded only by lung cancer. The chance that breast cancer will be responsible for a woman's death is about 1 in 36 (about 3%). Death rates from breast cancer have been declining since about 1989, with larger decreases in women younger than 50. These decreases are believed to be the result of earlier detection through screening and increased awareness, as well as improved treatment. We offer hope for the fighters, peace for the survivors & prayers for the taken.